Among the officers and men of the expedition waiting at Cork was the 24 year old Captain William Warre who spent his time ‘in perfect idleness, though very gaily.’ Warre and his comrades amused themselves with boating parties, buying horses and attending the society of the town. A play was put on by the officers of HMS Resistance for the benefit of the poor of Cove, which ‘went off very well’ being exceedingly crowded. Not to be outshone by the navy, the army officers organised a ball ‘in a storehouse fitted up with flags’ for the ‘relief of the distressed soldiers’ wives’ who had lost the ballot to select those permitted to accompany the army. This made a clear profit of £50, although Warre admitted that this was ‘little enough among so many objects.’ Still its success encouraged a second ball a few nights later for the Dutch crew of the Guelderland frigate which had recently been captured with heavy casualties by the British frigate Virginie. How the young ladies of Cork must have sighed when the expedition finally sailed! (Warre’s letters to his father and mother, 17, 22 and 27 June 1808 Letters from the Peninsula p 4-9). The Spanish uprising caused considerable excitement among the officers of the army and they had little doubt that this would be their destination. William Gomm, a young staff officer, told his sister ‘The astonishing news we have lately received from Spain has set us all agog; and I may safely venture to assure you that Spain is going to import a whole family of Don Quixotes with the English army.’ (Gomm [to his sister Sophia? ], Cove, 9 July 1808, Letters and Journals p 99). The accusation of indulging his troops appears in three sources: William Clinton’s diary in July 1808, Lady Hester Stanhope’s passing comment, and, most surprisingly, in a vituperative letter from Thomas Graham written on 20 September 1808 who accuses AW not only of spreading discontent with Dalrymple, but courting popularity with the army and showing extreme familiarity with every rank in order to achieve it (T. Graham to R. Graham Lisbon 20 Sept 1808 HMC Graham of Fintry p 150). It is not hard to see that such ardent advocates of Sir John Moore as Lady Hester Stanhope and Thomas Graham would resent AW’s rise to prominence, but it was an odd accusation to make against AW, and even Graham says that reports of AW in India said rather that he was aloof and cold than overly familiar. Perhaps Graham was simply looking for any stick to beat AW with, and as he couldn’t say that AW was unpopular with the army, he attempted to make a vice out of it. In the same letter he also accuses AW of “having artfully laid the foundation of being called on on some future occasion to command … by his success” – which comes close to suggesting that if AW had been honest he would have let the French win! I conclude now that Sir John Moore is certainly intended for Spain. If a British army is to go there it cannot go in safer hands, but in the meantime much mischief may be done to the cause by the landing of a corps under such a man as Sir A. Wellesley, who, though I believe is a very gallant man, has not hitherto shewn judgement in his military career in any instance and who, I fear, would not advert to the grand requisite of the strictest discipline being maintained by any troops of ours who should set foot on the Spanish shore. (Clinton Diary vol 47 p 50, London, Sunday, 3 July 1808, Ward Papers 300/7/1 p 50). Great hopes had rested on Moore for years as the most promising talent in the army, and only a few of the most perceptive and well-placed critics shared Anstruther’s doubts or understood the ministers’ distrust of him. Six weeks before Captain Gomm had welcomed Wellesley’s appointment, he had written, ‘There is … no general under whom I am so desirous of serving, as Sir John Moore’, and this was probably still the common feeling in the army, and although the change of sentiment had already begun, it would take several years – until the spring of 1811 at least – for it to be completed. (Gomm to his sister, 1 May 1808, Letters and Journals p 95; for Anstruther, see p 228 of the main text). Wellesley had asked that Anstruther be given one of the key staff appointments as either Adjutant-General or Quartermaster-General of the army, but Anstruther privately indicated that he would prefer a substantive appointment in command of troops, and the Horse Guards, which recognized his ability, obliged, giving him the command of a strong brigade of infantry which was being prepared at Ramsgate. (AW to J. W. Gordon, 5 July 1808, BL Add Ms 49,480 no folio in Ward Papers Mss 300/3/1; Murray review of Napier Quarterly Review April 1836 p 192). In the end, Wellesley received Lieutenant-Colonel George Tucker at the head of his Adjutant-General’s department, and Lieutenant-Colonel James Bathurst at the head of his Quartermaster-General’s department (both with the rank of Deputy). There seems to have been some awkwardness in these appointments, for both Tucker and Bathurst were serving with Spencer’s corps, and so were unable to join the army until after it had disembarked in Portugal. Nonetheless, they both then made a good impression, and Wellesley went on to employ Bathurst as his military secretary in 1809. Bathurst’s quick temper made that appointment rather unfortunate, but he was an experienced and efficient staff officer, who played his part effectively in the 1808 campaign. Tucker died in a shipwreck on the way home from Coruña. (For Bathurst see Ward Wellington’s Headquarters p 60-61 and AW to Spencer, 26 July 1808, WD III p 38; The Times 16 July 1808 lists Major Arbuthnot as senior AG officer. For Tucker see Proceedings of the Cintra Inquiry p 226, and a brief obituary of him in the Gentleman’s Magazine February 1809 p 185). Somerset owed this first appointment on Wellington’s staff to the Duke of Richmond who had written in June, ‘[General] O’Hara used to say that he had rather have a wife recommended to him than an aide-de-camp. Notwithstanding this, I will venture to say that FitzRoy Somerset is an active and intelligent fellow, and is anxious to go on service.’ (Richmond to AW, 11 June 1808, WSD vol 5 p 452-3). Somerset was the eighth and youngest son of the Duke of Beaufort and his brother Edward was one of Richmond’s ADCs, and would later serve in the Peninsula. He had accompanied Sir Arthur Paget on an unsuccessful diplomatic mission to Constantinople in 1807, and had been in the army, nominally at least, since 1804, but this would be his first campaign. I have been obliged to speak to him pretty sharply once or twice principally relating to his want of care of himself when he was sick; & now he is as much afraid of me as he is of you … I see clearly that he is heartily tired of his new line of Life; that his is dying to return to England, & that he will make use of any pretext to get away. (AW to William Wellesley-Pole, 6 Sept 1808, ‘Letters to Pole’ p 8-9). Evidently the failure was not entirely unexpected, and in the following year Lord Wellesley took up the task, employing his nephew on his staff during his mission to Cadiz. This was rather more successful – young William was ‘very diligent’ and ‘improved’, but he had no sooner returned home than he offended Arbuthnot who had previously treated him with ‘cordial affection’. (Lord Wellesley to William Wellesley-Pole, 30 Oct 1808 quoted in Butler Eldest Brother p 433; Arbuthnot to Lord Wellesley, ‘Private’, 12 Dec 1809 Wellesley Papers vol 1 p 291). He became famous in 1812 by marrying the fabulously rich heiress Catherine Tylney Long and changed his own name to the much ridiculed mouthful: William Pole Tylney Long Wellesley. The marriage was not happy and his later life was beset by debts and scandal, but for a few years he cut a colourful figure in Parliament and society. (Thorne History of Parliament vol 4 p 847-8; see also Complete Peerage vol 9 p 240-1 (Mornington) which quotes the Morning Chronicle’s obituary: ‘Redeemed by no single virtue, adorned by no single grace, his life has gone out without even a flicker of repentance; his “retirement” was that of one who was deservedly avoided by all men.’). Lieutenant-Colonel Henry Torrens, was twenty-nine years old, the orphaned son of an Irish clergyman, who had already spent half his life in the army, and survived the rigours of Abercromby’s campaign in the West Indies. In Holland in 1799 Torrens was wounded for the second time and attracted notice for his gallantry, while he later served in Baird’s terrible march from the Red Sea to the Nile, which left him with sunstroke. He was on Whitelocke’s staff at Buenos Ayres but emerged with his reputation unscathed, even enhanced by the manner in which he gave evidence at Whitelocke’s trial. (Annual Obituary vol 13 p 62). His relations with Wellesley were excellent and when his son was born in the following year Wellesley agreed to be the boy’s godfather, and he was christened Arthur Wellesley Torrens. Wellesley and Torrens both expected to renew the connection in 1809, but Torrens was instead asked to accept the post of military secretary to the Commander-in-Chief at the Horse Guards. This was not an offer which could easily be refused, and he remained in the post, serving Sir David Dundas and the Duke of York, until 1820. His position was not easy, especially given the tension which often existed between Wellesley in the Peninsula and the Horse Guards in London, and the pressure created by the conflict of loyalties sometimes became evident, but it is likely that these problems would have been much worse with a less sympathetic figure acting as intermediary. (Annual Obituary vol 13 p 62-63 says that he was to have returned to the Peninsula in 1809; DNB says that he was not appointed Military Secretary until October 1809, but it is likely that this had been arranged some months in advance. The Mary Anne Clarke scandal and the Duke of York’s resignation naturally complicated such appointments. The Annual Obituary points out that Torrens as the father of a young family found it difficult to refuse a secure desk job for an uncertain one in the field; but the Clarke scandal would have made it seem almost more cowardly to go to the Peninsula than to stay in London. According to the Royal Military Calendar (vol 3 p 390-2) he was Assistant Military Secretary before and after the 1808 campaign). Wellesley may also have been accompanied by a civil secretary, a Mr Williams, selected for ‘his particular acquaintance with the language and habits of Spain’ (The Times 17 June 1808), although little trace of his presence survives, and he may have been left at Coruña, or even been given up entirely when Portugal was confirmed as the destination of the expedition. One civilian who did find a niche at headquarters was Mr Barrington Pope Blachford, a member of Parliament and supporter of the government who was caught up in the popular enthusiasm for the Spanish cause and even considered joining the army. Wellesley warned against this, pointing out that it might be difficult for him to resign on active service if he found that he disliked the life, and offering to look after him if he came out simply as a traveller: ‘I shall take care of him, and [see] that he shall have his dinner and forage for his horse, and shall see everything that there is to be seen.’ (AW to Sturges Bourne, 23 June 1808, WSD vol 5 p 461-2). This was remarkably accommodating, and Blachford evidently enjoyed his expedition and was highly impressed with Wellesley, whom he praised in Parliament in January 1809, and whom he rejoined for a second visit to the Peninsula in the summer of 1809. (Thorne History of Parliament vol 3 p 210-11; AW to Blachford, 20 Oct 1808, WSD vol 6 p 165; AW to Lord Wellesley, 8 Aug 1809, ibid p 325). As well as Blachford, there was Viscount Ebrington, son of Lord Fortescue and a member of the Grenville-Buckingham connection. Ebrington obtained an ensign’s commission in the 9th Foot and looked to Buckingham’s friendship with Sir Arthur Wellesley to secure him a place as a supernumerary ADC. This may have been accomplished, for he returned from Portugal with Wellesley and Ferguson in 1808, but went back to the Peninsula either later in the year or in 1809, and is said to have been at the Battle of Almonacid (in which the Spanish army was defeated) on 11 Aug 1809. (Tom Grenville to Buckingham, 1 Aug 1808, Memoirs of the Court and Cabinets of George III vol 4 p 237-9; ‘An Account of the Extraordinary Expenses of the Army incurred and paid by the Right Honourable the Paymaster General of His Majesty’s Forces from 25 December 1808 to 24 December 1809’ Parliamentary Papers 18 April 1810 p 5, for his return from Portugal with AW (courtesy Ron McGuigan); Thorne History of Parliament vol 3 p 791-3). The Crocodile was commanded by the Hon. Captain George Cadogan, whose sisters had married Gerald and Henry Wellesley. While this, and Pulteney Malcolm’s role as senior naval officer, may have been coincidences, it seems likely that William Wellesley-Pole used his position at the Admiralty to ensure that Arthur Wellesley would be met by friends and connections, and, perhaps as a result, the two services co-operated remarkably well throughout the campaign. (O’Byrne Naval Biographical Dictionary vol 1 p 159, vol 2 p 714n). Illuminations in the Town, rejoicings among the troops, and an enormous crowd to meet us on the beach; in fact, the celebrations in honour of this great event have been so excessive that I have not had a moment’s peace – a guard of honour with a band of music at my door stun me when I am at home, deputations from everybody I ever heard of come every half hour, and artillery salutes me when I stir. (Quoted in Stuart Wortley Highcliffe and the Stuarts p 119). The Spanish authorities granted Wellesley permission to shelter the expedition at Vigo, and even to land the troops, if he was forced to delay his attack on Portugal, although it is clear that they thought that this would be unnecessary. Fitzroy Somerset wrote home from Oporto: ‘We slept last night in a house belonging to the British Consul, who is not yet returned, but we found Colonel Brown[e] there, who furnished us all with beds.’ And ‘the Bishop, who at seventy years [?] old is turned General, & has embodied all his priests and I understand it is extremely ludicrous to see the fat fellows mount guard, going [at] a funeral pace, & carrying their swords erect as if they were Tapers.’ (Fitzroy Somerset to his brother, Oporto, 25 July 1808, Badminton Muniments 4/1/4/1). I there received letters from Gen. Spencer, at Puerto de Sta Maria, in which he informed me that he had landed his corps in Andalusia, at the request of the Junta of Seville, and he did not think it proper to embark it again till he should receive further orders from me; and he appeared to think that my presence in Andalusia, and the assistance of the troops under my command, were necessary to enable Gen. Castaños to defeat Gen. Dupont. As I was of opinion that the most essential object for the Spaniards, as well as for us, was to drive the French from Portugal, and that neither his corps nor mine was sufficiently strong, when separate, to be of much service anywhere, and that when joined they might effect the object which had been deemed of most importance in England, and in Galicia, I immediately dispatched orders to Gen. Spencer to embark his troops, unless he should be actually engaged in an operation which he could not relinquish without loss to the Spaniards, and to join me off the coast of Portugal. (WD III p 137-8, Narrative of the Proceedings of an Inquiry p 24). When AW learnt that the government were sending out reinforcements, his reaction may have been tempered by the fear that the ministers would disapprove of his recall of Spencer. Fortunately news arrived that day that the Spanish army commanded by General Castaños had defeated the French army in Andalusia and forced it to capitulate at Bailen, removing any threat to Cadiz and freeing the whole of southern Spain, while making Junot more isolated than ever. (News of Dupont’s surrender: AW to Castlereagh, 1 Aug 1808, WD III p 42-6 and postscripts; AW to Richmond and AW to Castlereagh, 1 Aug 1808, ibid p 46, 46-7). The news of Wellesley’s supersession was brought by Lord Burghersh, the eldest son of Lord Westmorland (a member of the cabinet), who arrived to join Wellesley’s staff. It is probable that Burghersh was able to explain the background to the cabinet’s decision more frankly than any minister could put on paper, and that he brought a letter on the subject from William Wellesley-Pole. No letter from Pole survives, but AW told Castlereagh ‘Pole and Burghersh have apprised me of the arrangements for the future command of this army; and the former has informed me of your kindness towards me.’ (AW to Castlereagh, 1 Aug 1808, WD III p 46-7). AW first mentioned this idea when he wrote to Castlereagh from Oporto, telling him that the Portuguese could raise ‘38,000 men with ease, if they had arms or money to pay them.’ (AW to Castlereagh, 25 July 1808 WD III p 36-37). Wellesley’s idea was not entirely original, for a similar scheme had been floated some years before by Lieutenant-Colonel Richard Stewart, when he was sent to Portugal by the British government in 1803. Stewart concluded that while Portugal had great potential, Britain would need to make a large commitment and a core of troops of her own if it was to harness it. This is not to suggest that Wellesley was simply regurgitating Stewart’s ideas – there was much more to his plan than that, and it was his vision which applied it to the very different circumstances of 1808 – but it Stewart’s paper was evidently the source of his data, and perhaps also of the central concept. This excuses AW from the accusation that he was rash in making such a proposal when he knew very little about the state of Portugal. For Stewart’s mission to Portugal see Martin Robson ‘British Intervention in Portugal, 1793-1808’ Historical Research vol 76 2003 p 97-98. This was the same Richard Stewart who had been AW’s 2inC in Denmark, and who was, in 1808, with Moore’s Baltic expedition. As well as Spencer’s corps, AW expected Acland’s brigade to arrive any day – he had been told that it would sail on 19 July. He also knew that Loison had been detached by Junot, which reduced the risk of the French attacking him soon after he had landed his force. See AW’s Narrative to the Court of Inquiry Proceedings p 25 (also in WD III p 138). What date did AW land at Mondego Bay? My thanks to Arthur Murchison for helping to untangle this puzzle. The whole army seems to have landed without any lives being lost, except possibly one or two horses. Oman Hisotry of the Peninsular War (henceforth cited simply as Oman) vol 1 p 229 and Fortescue History of the British Army (henceforth cited simply as Fortescue) vol 6 p 203 both say that a few lives were lost, but this is directly contradicted by Geike Life of Murchison vol 1 p 27; Leach Rough Sketches p 42; and Warre Letters from the Peninsula p 15-16. Of course these eye-witnesses may not have known of some deaths, but there are signs that Oman and Fortescue have been influenced by firsthand accounts of the landing of Acland’s and Anstruther’s brigades and other later arrivals, which proved more costly. See Capt Pultney Malcolm’s evidence to the Cintra Inquiry Narrative of Proceedings p 36, and H. N. Shore ‘The Navy in the Peninsular War. Naval Operations during Sir A. Wellesley’s First Campaign’ United Service Magazine new series vol 47 1913 p 153-6. In the introduction to the one volume edition of Wellington’s General Orders, Gurwood claims that: ‘When Sir Arthur Wellesley first landed in Portugal he was in command of a disjointed army, consisting of a few sturdy regiments, well nigh in rags, the greater part having just returned from the expedition to Buenos Ayres, – two weak squadrons of cavalry, indifferently mounted on foreign horses, and a small force of artillery…’ (p liii-liv). However this does not seem to be correct. The regiments from Buenos Ayres got home at the end of 1807 (Soldier of the 71st p 14) and it would be very surprising if they were not refitted and – if necessary – reclothed in the five months they spent in Ireland. The general view (e.g. Glover Britannia Sickens p 46-47) has always been that the individual regiments in this army were very good, although the supporting services were inadequate, and that it lacked the coherence of a properly formed army. The artillery crews were competent and their weapons effective. They were equipped with light 6 pounders, 51/2 inch howitzers, and 9 pounders. (See T. H. McGuffie ‘British Artillery in the Vimeiro Campaign’ J.S.A.H.R. vol 23 no 94 summer 1945 p 80-81 on the strength and composition of Wellesley’s artillery). The Irish horses were better than nothing, but they were far from ideal as Wellesley made clear to Castlereagh: ‘Our artillery horses are not what we ought to have. They have great merit in their way as cast horses of dragoons, and Irish cart horses, bought for £12 each! but not fit for an army that, to be successful and carry things with a high hand, ought to be able to move.’ (AW to Castlereagh, Caldos, 16 Aug 1808, WD III p 80). The horses and their drivers belonged to the Corps of Waggoners, which was part of the Irish Commissariat, and quite separate from the Royal Waggon Train, although the men who volunteered to serve in the Peninsula were later incorporated into the Royal Waggon Train. (Information from Ron McGuigan). AW wrote to Pole about the artillery horses: ‘I think Lord Chatham will repent that he did not allow me to have Artillery Horses. Those we have are very fair, & good of their kind. But marching as we do every day we ought to have the best horses the Army could afford, instead of the worst; & likewise a regt. of mounted Cavalry.’ (AW to William Wellesley-Pole, Vimiero, 19 Aug 1808, ‘Letters to Pole’ p 4-5). Southey (History of the Peninsular War vol 1 p 554-5n) prints a partial defence of the horses which matches well with AW’s comments – they were fine for every day employment at home, but were not up to the rigours of active service. See also Chatham to the King, 29 Jan 1809 and enclosure Later Correspondence of George III vol 5 p 181-3 where he claims that Wellesley was offered but refused artillery horses and defends the performance of the Ordnance. Against this, see AW to Castlereagh, 29 June 1808, WSD vol 6 p 86-87; AW to Hill, 3 July 1808, WD III p 22; and AW to William Wellesley-Pole, 19 Aug 1808 ‘Letters to Pole’, p 4-5. The traditional view of the commissariat in the 1808 campaign is highly unflattering, and generalized references are made to the lack of training of its members and the ease with which anyone could become a commissariat officer: corruption and inexperience are added for good measure. No doubt some of this is justified: the commissariat certainly was inexperienced, and the shortage of transport caused problems for the army. Yet there were relatively few complaints, while there are a number of comments (some quoted later in the chapter) praising the commissariat arrangements so long as the army was commanded by Wellesley and noting how rapidly they deteriorated once Dalrymple took command (and the arrival of reinforcements added to the number of mouths to be fed, while the army stopped moving into new country). In general the army drew on local supplies for meat, wine, and extras such as fruit, but depended on the fleet for most of its bread and some other provisions, such as oats for the horses. (See AW’s narrative to the Cintra Inquiry Narrative of Proceedings p 27 (WD III p 141) and several interesting answers to questions ibid p 31-33 (WD III p 143-5). For AW’s high praise of Mr Walsh, the contractor who supplied the army with beef, see AW to Murray, 15 Sept 1808, WD III p 122-123). I have always felt the inutility and inconvenience of the office of second in command. It has a great and high sounding title, without duties or responsibility of any description; at the same time that it gives pretensions, the assertion of which is, and I believe you know I found them in one instance to be, very inconvenient. Every officer in an army should have some duty to perform, for which he is responsible…. The second in command has none that anybody can define; excepting to give opinions for which he is in no manner responsible, and which I have found one at least most ready to relinquish, when he found that they were not liked in England. (Wellington to Beresford, 2 Dec 1812, WD IV p 188-9). This clearly refers to Spencer, and in particular his evidence to the Cintra Inquiry when he failed to give Wellesley the support which Wellesley had a right to expect. Up till then, Wellesley had been willing to overlook Spencer’s faults, had sympathized with his unhappiness at coming under Dalrymple’s command (with whom he had quarrelled at Gibraltar), and had even urged Castlereagh to give him a mark of official favour, writing ‘There never was a braver officer, or one who deserves it better.’ (AW to Castlereagh, 23 Aug 1808, Castlereagh Correspondence vol 6 p 410-12; Spencer’s supplementary evidence to the Cintra Inquiry given on 13 Dec 1808 Narrative of Proceedings p 95-6 which stands in sharp contrast to his letter to AW written on 30 Sept 1808 and printed in WSD vol 6 p 142-3. The change explains AW’s subsequent disenchantment with him, for which see Journal of Mrs Arbuthnot 11 May 1823 vol 1 p 234; and Croker Papers 25 May 1831 vol 2 p 123). The person who is sent here as Second in Command is very unfit for his situation. He is a good executive Officer; but has no mind; and is incapable of forming an opinion of his own and he is the centre of all the vulgar & foolish opinions of the day. Then you are aware that from former experience, I cannot depend upon him for a moment for anything. He gives his opinion upon every subject; Changes it with the Wind, and if any misfortune occurs, or the act recommended by him is disapproved of, there is no support to be looked for from him. On the contrary the Royal Family at their dinners or their Card Parties would make him say what they please, & he would swear to it afterwards. (Wellington to William Wellesley-Pole, 5 Sept 1810, Wellington A no 34, Raglan Papers, Gwent Record Office – passage suppressed in version of the letter published in WSD but partly quoted in Oman vol 4 p 552n and Fortescue vol 7 p 499 with minor variations and the last sentence omitted). Hill and Ferguson were the most senior and important brigade commanders: the remaining brigades were commanded by more junior officers who held the temporary local rank of brigadier. Miles Nightingall was the illegitimate sone of Lord Cornwallis who had greatly assisted his early career. He evidently impressed Wellesley in 1808, but when he returned to the Peninsula in early 1811 his health and spirits were both poor and he only stayed a few months before taking a command in Bengal. In 1809 he at first accepted, and then declined, Castlereagh’s offer that he succeed Captain Bligh as Governor of New South Wales, thus opening the way for his intended deputy, Lachlan Macquarie, who was to prove the most successful of all Australia’s early colonial governors. (‘The Nightingall Letters. Letters from Major-General Miles Nightingall in Portugal, February to June 1811’ edited by Michael Glover J.S.A.H.R. vol 51 autumn 1973 p 129-54, esp p 129-30; Glover Wellington as Military Commander p 195-7; Royal Military Calendar vol 2 p 379-85; Castlereagh to the King, 8 April 1809, Castlereagh Correspondence vol 8 p 200). The 4th brigade was commanded by Brigadier Barnard Foord Bowes, who Wellesley praised in 1810 as ‘an officer with whom I am well acquainted … highly deserving of the confidence you are disposed to place in him.’ (Wellington to Maj-Gen W. Stewart, 27 Feb 1810, WD III p 748). He was killed in the attack on the Salamanca forts in June 1812. Catlin Craufurd – not to be confused with the more famous Robert Craufurd – returned to Portugal but died of a fever at Abrantes on 25 September 1810. He left a widow ‘with a large family in very bad circumstances’; and Wellesley urged the government to grant her a pension – something which was evidently not common practise where an officer had not fallen in action. (Wellington to Liverpool, 30 Nov 1810, WD IV p 438). The 6th or Light Brigade was commanded by Henry Fane, the nephew of the Earl of Westmorland, an MP, and an ADC to the King. This was his first campaign, so it is not surprising that Roderick Murchison thought him ‘fidgety’ when the troops first landed, but he soon settled and was praised by his troops and his staff. He went on to serve throughout the Peninsular War, generally commanding a brigade of cavalry attached to Hill’s force, and proving efficient and reliable. (DNB ; Thorne History of Parliament vol 3 p 723; Geike Life of Murchison vol 1 p 25; Recollections of Rifleman Harris p 13, 35; Landmann served on Fane’s staff during the campaign and writes of him with a mixture of admiration and affection: Landman Recollections vol 2 p 93ff; on later campaigns see Tomkinson Diary of a Cavalry Officer p 235 and Glover Wellington as Military Commander p 218). As the army prepared to begin the campaign, Wellesley issued a series of detailed orders governing the routine of daily life on campaign. For example, meat was to be issued to soldiers in advance, so that they could cook it and carry it with them on the following day, while officers were repeatedly forbidden from using the army’s carts and mules to carry their baggage. (GO 8 Aug 1808, WD III p 57n). Wellesley’s instructions for his light infantry are particularly interesting. Fane’s brigade consisted on the 5/60th and four companies of the 2/95th, both units of green clad riflemen skilled in the art of skirmishing in open order and taking advantage of cover, and Wellesley ordered that it should lead the advance, whether the army marched by its right or left; while if the army was forced to retreat, it would cover the rear. Meanwhile the light companies of the line battalions in each brigade were combined under the command of a field officer in order to provide a skirmishing screen for the brigade. This system was modified on 18 August when Wellesley attached a company of the 5/60th to each line brigade to assist the less specialized light companies, and compensated Fane with the 1/50th from Craufurd’s brigade. (GO 3 Aug 1808, GO 8 Aug 1808, MGO 18 Aug 1808, WD III p 50n, 68n, 84n). Thus from the very outset of the war in the Peninsula Wellesley showed himself keenly aware of the importance of light infantry and devised a system which would provide both for a concentrated force of specialist skirmishers, and still protect the rest of the army. With some adaption to allow for the creation of divisions and the presence of Portuguese caçadores, this system would be employed, most successfully, in all his campaigns. Wellesley was not, of course, the only general in the British army to utilize light infantry – the subject had been a fashionable topic of experiment and discussion in military circles for years – but his success in turning theory into practise, and unwavering support for his ‘light bobs’ has often been rather overlooked. See also AW’s exceptionally warm tribute to Major Travers and the 95th Rifles after the campaign: (AW to Lt-Col Gordon, 29 Oct 1808, WSD vol 6 p 178). AW’s General Order of 3 Aug 1808 (WD III p 50) includes the statement: ‘The order of battle of the army is to be 2 deep’ – there is no elaboration, and it is not quite certain that this refers to the number of ranks in a battalion in line, rather than to a higher formation. Curiously, this appears to be the only order issued by AW which might refer to the subject – which suggests that by 1808 it was the generally accepted practise throughout the army. AW told the Cintra Inquiry that the advance of the main body was delayed until the 10th (presumably from the 9th) at the request of the Portuguese commanders Proceedings p 25 WD III p 139. The soldiers’ day began early: they were assembled in their ranks before first light as a routine precaution against a surprise attack. The day’s march usually commenced between 4 and 5 am and the troops would reach their campsite by the middle of the day, so that they did not have to march through the heat of the afternoon. (GOs 13-17 Aug 1808, WD III p 73n-81n.). This pattern was followed throughout the war and Kincaid records that young soldiers were often so exhausted by the march that they would go straight to sleep and only wake when it was growing dark with no comforts about them, while tougher veterans would have collected water, built a fire, cooked their meat and often contrived some rough shelter, none of which luxuries they were likely to share with their ‘new chums’. (Kincaid Random Shots p 209-10 (combined edition)). But as yet the whole army was unused to campaigning, and its commonplace discomforts still had novelty: Captain J. M. Wynyard of the Coldstream Guards, serving on the Adjutant-General’s staff, noted tersely in his diary for 10 August, ‘I slept in the yard of a farm hut. Devoured by fleas.’ (Wynyard, John M. ‘From Vimeiro to Corunna. An Eyewitness Account’ edited by S. G. P. Ward J.R.U.S.I. vol 114 Dec 1969 p 35). And after three weeks ashore, Fitzroy Somerset wrote home to his brother, the Duke of Beaufort, ‘I am in perfect health though I have only slept three times in a bed since I landed. The only thing that annoys me, is, the quantity of flies & Bugs which meet one everywhere, whether laying on a mattress, or on the floor.’ (Somerset to the Duke of Beaufort, Vimeiro, 22 Aug 1810, Badminton Muniments 4/1/4/3). Oman (vol 1 p 233) accepts AW’s account of his quarrel with Freire without hesitation and condemns Freire’s conduct in the strongest terms. But Southey suggests that Freire had been alarmed for the safety of Coimbra by reports that the French were planning to repeat the massacre of Evora there (vol 1 p 539), and even if this is not accepted, it does not seem that Freire’s behaviour was so unreasonable. He suggested advancing via Santarem because supplies would be more easily obtained on that route, but was willing to go via the coast road if the British overcame this problem. What was so ‘absurd and impudent’ about that? (Oman vol 1 p 233) Still, he aroused Wellesley’s suspicion and it is not unlikely that he was intimidated by the French and anxious to find an excuse to avoid battle. Forjaz, in a letter of August 16, 1808, clearly indicates [that] the Portuguese refusal to join Wellesley on his march to Lisbon did not stem entirely from the inability of the Portuguese to secure provisions along the British route, as Freire had originally stated. Nor was it from fear of meeting the French or jealousy of command, as some historians have speculated. The refusal was based upon the opinion that the main objective of the Portuguese army could not be solely to occupy Lisbon while the strong possibility existed that there would be a need to protect the provinces from the ravages of the French army, should it withdraw from the capital. (Francisco A. De La Fuente ‘Dom Miguel Pereira Forjaz: his early career and role in the Mobilization and Defence of Portugal during the Peninsular War, 1807-1814’ (unpublished PhD thesis presented to Florida State University 1980) p 72-73). Loison’s column was of particular concern, but if Freire did not understand that the best way to bring Loison back to Lisbon was to attack Junot, then he was a fool, and Wellesley’s irritation with him was quite reasonable. Loison marched from Lisbon on 25 July; on the 29th (or 30th: Foy and Oman say the 29th; but Victories, Conquetes and Martinien both say 30th) he broke through a courageous but ill-judged attempt to block his path and ruthlessly sacked the town of Evora, inflicting an estimated 2,000 casualties, most of them civilians for the loss of fewer than one hundred killed and two hundred wounded. He paused for a day or two at Evora and then marched on the Elvas and even crossed the border into Spain summoning Badajoz to surrender, when he received messages from Junot urgently recalling him. Wellesley broke the news of Pakenham’s wound in a letter to Lord Longford and sent Richmond a letter to Kitty to be delivered if she was likely to hear the news before Longford could tell her. This was very considerate – Pakenham’s wound was not at all serious – but it is singular that the only letter from Wellesley to Kitty to be recorded should be sent via a third party with the hope that it not need be delivered. Presumably there were other letters, (Wellesley had written frequently from Copenhagen), but they have disappeared without trace. (AW to Lt.-Col J.W. Gordon 18 Aug 1808 WD III p 84-85 (Pakenham continues to serve with regiment); AW to Richmond 16 Aug 1808 WD III p 80 (enclosing letter to Kitty – not printed); Wilson Soldier’s Wife p 111-12 (implication no other letters have survived); AW to Castlereagh 18 Aug 1808 WD III p 85 states that he encloses another letter to Longford ‘to tell him that his brother is quite well’). Major Gen Hill and Brig. Gen. Nightingall advanced upon the enemy’s position, and at the same moment Brig. Gen. Fane’s riflemen were in the hills on his right, the Portuguese in a village upon his left, and Major Gen. Ferguson’s column was descending from the heights into the plain. From this situation the enemy retired by the passes into the mountains with the utmost regularity and the greatest celerity …. It was then necessary to make a disposition to attack the formidable position which he had taken up. Brig. Gen. Fane’s riflemen were already in the mountains to his right; and no time was lost in attacking the different passes, as well to support the riflemen as to defeat the enemy completely. The 2nd & 4th Brigades under General Ferguson were ordered to take a circuitory route to the left by Bombarral, which was effected with great difficulty. On approaching the village, a signal was made by the advance parties of an enemy discovered. The Line was immediately formed with the 40th in column on the left leading to form in line or en potence as might be required. The Brigades advanced and in a quarter of an hour, the enemy was discovered in front of our right flank retreating before Sir Arthur Wellesley in very good order, frequently and regularly forming to the front. At this time, Colonel Tucker, Adjutant-General came to us from the Commander-in-Chief with an order to post the troops in the rear of the rising ground on our front, and expressing an opinion at the same time that the enemy’s flank would be completely turned by our movement. This unfortunately however was not the case for a message from Sir A. Wellesley obliged General Ferguson to take a direction more to the right, and the right flank of the enemy remained during the retreat unmolested except by the Light Corps, and after passing the heights completely so. After showing every inclination in the plain to give us battle, the enemy retired to the heights between Sal Alameda and Zambujeira where their guns were very advantageously posted. On our joining the four Brigades under Sir Arthur, but few shot had been fired by the troops of the Line. At that moment, however, the Light Infantry Companies were ordered to advance, which they did under very heavy and well directed fire. Whenever their troops met the French, the latter retired and upon observing this, the 29th & 9th Regiments were ordered to advance up a gulley [sic], where the fire was tremendous in the extreme…… [Goes on to describe Lake’s death etc, but this must be secondhand] (From Vimeiro to Corunna. A Eyewitness Account J.R.U.S.I. vol 114 Dec 1969 p 35). Looking through this closely, we see that the first part refers to the early part of the day: the march around the French flank. Colonel Tucker comes and then a second, unnamed messenger – whom Wynyard thinks came from AW, though AW’s flat denial to Pole shows he was mistaken. (Or, the messenger did come from AW, but his message was mistaken?) As a result of this second message, Ferguson descends to the plain, abandoning his turning manoeuvre and arriving in front of, not in the rear of, the French. They arrive before more than a few shots had been fired. Wellesley then orders a frontal attack. I went on across the valley with Ferguson, sometimes conversing with Geary, and sometimes with Bowes, always in good spirits; for I now regarded my fortune as secured, having directed the movement which Ferguson and Bowes, and many others, thought must terminate in the capture of the whole of Laborde’s division before the other portion of the enemy could come up. We thus continued to advance about four miles by the road, which was sufficiently retired from the edge of the hills to conceal our line of march, no one daring to go to the right on the crest of the range of hills we were on, lest the enemy should see us. On one occasion, with the General’s permission, I reconnoitred on foot to the distance of half a mile; with one pistol in my hand and the other in my sash, I crept along amongst the bushes, and looked over into the valley, where I saw our main body considerably in the rear of us, which I hastened back to report to Ferguson. Just as I had communicated my information, I observed an Aide-de-camp with two epaulettes, the distinction worn by those attached to His Royal Highness the Duke of York only. This officer came up at a hand gallop, with a fine white sheep-skin covering to his saddle, and extending much beyond it, and ordered General Ferguson to descend from the heights, and join the main body in a front attack; adding, that he had ascertained the road we were following would not lead us to turn the right flank of the enemy, as had been misrepresented, but lead away to our left. I was never more vexed in my life, as I was on hearing Colonel Brown[e]’s order. Down we all went, by a winding, steep, and almost impassable road for artillery, and so with much unnecessary fatigue joined the central column of attack, near the four windmills, on a sandy plain covered with pine and olive trees…. Landmann’s account is certainly circumstantial, and some of the details can be verified, for example Lieutenant-Colonel Samuel Browne, the officer Castlereagh had sent to Oporto, had been appointed Assistant Secretary and ADC to the CinC in Dec 1806 and was present as a volunteer at the battle of Roliça (Royal Military Calendar vol 4 p 186-7). Which raises the interesting question of whether Browne was acting on his own authority (as Landmann implies) or conveying orders from someone else (Wynyard’s version). There are difficulties with either possibility: if the former, why did Ferguson accept his opinion and deviate from his orders? If the latter, who gave the order: the only real possibilities are AW himself – which he explicitly denies – or Spencer. And why did AW not blame anyone for it, publicly at least? He recommended Spencer to Castlereagh at the close of the campaign, and was evidently on good personal terms with Ferguson (they travelled home together), and if Browne was to blame, why let him off without a public rebuke? (Possibly because he was one of York’s ADCs and had been sent out by Castlereagh… It is possibly significant that he did not serve again in the Peninsula). Map of Roliça published in contemporary pamphlet by Stockdale, (A Narrative of the Campaign, which preceded the Convention of Cintra…, London, Stockdale, 1809) very closely based on a plan prepared by the QMG’s department in London from a sketch made on the ground by Lieutenant-Colonel Brown[e] which shows that Ferguson’s column (marked C on the map) descended onto the plain in front of the main French position and did not outflank it. A manuscript copy of the QMG’s department map is in the Holworthy Collection CKS-U929 at the Centre for Kentish Studies, Maidstone. Fortescue (vol 6 p 211) and Glover Britannia Sickens p 82 follow this closely, but there is no evidence in any of the sources that AW attempted to repeat the morning’s manoeuvre or, more specifically, that Ferguson’s column was sent back into the hills once it had descended, although certainly it did not come into action until the very end of the battle, and then but slightly. Napier says much the same as Oman: ‘To dislodge him fresh dispositions were necessary. Trant continuing his march, was to turn his left, Ferguson and Fane united, were directed through the mountains to turn his right’ (vol 1 p 129). Oman disputes in a footnote the linking of Fane and Ferguson, and certainly Fane’s riflemen were heavily engaged and Ferguson’s troops were not; but the explanation may be that Ferguson was employed in supporting the light infantry on the British left. The Portuguese infantry were ordered to move up a pass on the right of the whole. The light companies of Major Gen. Hill’s brigade, and the 5th regt., moved up a pass next on the right; and the 29th regt., supported by the 9th regt., under Brig. Gen. Nightingall, a third pass; and the 45th and 82d regts, passes on the left. These passes were all difficult of access, and some of them were well defended by the enemy, particularly that which was attacked by the 29th and 9th regts. These regiments attacked with the utmost impetuosity, and reached the enemy before those whose attacks were to be made on their flanks. The second [mistake] was that Lake went up the wrong pass; he ought to have gone up that on his right; he hurried his Men, did not clear the pass of the Enemy by his Light Infantry before he entered with his column; & he hurried his attack before the 5th regt. or any of the other troops ascended the other passes to support him. And both Thomas Gell and Colonel Leslie are consistent with the idea that Lake attacked up the wrong pass, and with too much eagerness, but not that he brought on the whole battle prematurely. We afterwards understood that it was not intended the 29th should have so soon attacked the strong pass, nor penetrate so far as we did, but were merely in the first instance to have occupied the village of Columbeira, and make a demonstration on the enemy’s centre, whilst General Ferguson on the left, and General Hill on the right, should attack and turn his flanks. By some mistake, however, the order was misunderstood, and our gallant Colonel pushed on. [Military Journal of Colonel Leslie of Balquhain p 44-45]. This is probably the origin of Oman’s idea that Colonel Lake had attacked prematurely, against Wellesley’s wishes, and while the flanking marches were still underway. But as we’ve seen, Ferguson’s march had been cut short, and AW does not make this complaint against Lake. After Ferguson’s march was aborted, AW saw no alternative but a direct attack on the French position, but he did not intend it to be quite as direct as Lake made it. AW wanted to first clear the gullies with light infantry, and when the moment to press forward came, to push up gullies on the flanks. Lake sent his men up the wrong gully, and too soon, as a result suffering more heavily than was necessary, but also inflicting heavy losses on the French. Although AW believed that it might still have been possible to cut off Delaborde’s retreat, this seems excessively optimistic – Delaborde seems to have been too capable to risk that, witness his skilful withdrawal in the morning. Lake’s over-eagerness was the sort of thing which happened in most battles, though it probably strengthened AW’s inclination to curb his subordinates’ room for displaying initiative. It may be significant that no one mentions his brigadier – Nightingall – but there is not enough evidence to judge. Everard (History of Thos. Farrington’s Regiment p 281-2) says that Colin Campbell was near Lake when he fell, which prompts thoughts as to whether he had been sent to restrain him or find out what was going on, but again this is no more than speculation. Figures from return printed in the Proceedings of an Inquiry p 162-3. The much less detailed return printed in WD III p 83 gives the same total. It is reproduced here as it is not readily available elsewhere, unlike the returns for the later battles, which are given fully in Oman’s excellent appendices. Verner History & Campaigns of the Rifle Brigade vol 1 p 315 states that the 95th lost 17 men killed, 3 officers and 33 men wounded, a total of 53 casualties (cf 42 given in the return) although he then says this was ‘a total of 50 casualties’. If this is accepted the total losses for the army should be increased by eleven to 490. Fortescue vol 6 p 213 thinks that there were 78 not 70 missing men, and so gives a total of 487 not 479. Oman vol 1 p 240 gives a total of 474, without explanation. This is interesting and quite possible, but there is little evidence to support it; and it is not clear that Ferguson’s column could really have resumed its outflanking manoeuvre as easily as Napier suggests. Besides, it is not clear that the implication, that a bloodless victory, manoeuvring Delaborde out of his position would have been preferable, is accurate. Wellesley’s army gained a great deal of confidence from this initial victory, and it set the tone of the campaign, in a way that a day of manoeurvres, however successful, would not. Most secondary sources praise Delaborde’s conduct of the operation highly, but it must be asked whether he gained anything that was worth the casualties suffered and the risk run? There is no doubt of his tactical skill, but the decision to engage in a serious fight is open to question. There are several possible justifications: he may have thought Loison was much closer than he really was and that he would be able to join him during the day, or the British attack may have forced the action on him, when he intended to withdraw before they advanced. While these are quite plausible, the result shows that he was playing with fire, and at the least got somewhat singed. ‘During the action a French Officer who was dying of his wounds informed me, that they had expected Loison to join them that day at one o’clock by their right, which was the reason for which they stood our attack, that their numbers were 6,000, and that their loss had been severe. Intelligence to the same purport was received from other prisoners; and as a small patrole of French infantry appeared at no great distance from the left of our position on the 17th at dusk, and I heard that Loison’s corps was at that moment arriving at Bombarral, which was about 5 miles from the field of battle, I conclude that the junction had been intended, and was prevented only by our early attack’ Proceedings p 27 (WD III p 141). Given the small size of the armies and even smaller numbers of men seriously engaged these losses were quite heavy: Roliça was not a full size battle, but nor was it a mere skirmish; it was the first of many intermediate scale actions which would include such notable engagements as the Coa (23 July 1810) and Sabugal (3 April 1811). As at Roliça the casualties in these actions were in the mid hundreds and neither main army was fully engaged. El Bodon would be another example. Coruña and Fuentes de Oñoro both had higher losses and both had the main body engaged. AW told the Cintra Inquiry he originally intended to use Acland’s and Anstruther’s brigades for the siege of Peniche – if that proved necessary – or diversionary landings near Lisbon while he pressed the French in front. But his disappointment at the level of Portuguese cooperation and especially ‘the determined and gallant resistance of the enemy’ at Roliça convinced him to add them to the main army. (Proceedings p 28 WD III p 141). Anstruther is usually said to have landed at Maceira Bay but S. G. P. Ward (p 6 of the extract of his unpublished life of Murray he sent me) says that Anstruther landed on the night of 19/20th at Paymayo (Pai-Mogo) Bay some eight miles further north – citing good evidence to support the point. This is confirmed by Neale Letters from Portugal and Spain p 7-9. Anstruther landed late on the 19th and joined army on 20th – AW’s Narrative to Cintra Inquiry Proceedings p 28 (WD III p 142), Kinloch A Hellish Business p 27-8 and Neale p 7. Kinloch says that the 2/52nd had only 300 men present, as a brig with 200 more did not arrive until the day after the battle (cf Oman vol 1 p 248n who puts 2/52nd at 654 all ranks and Fortescue vol 6 p 219 does not disagree). AW told the Inquiry that in the middle of the day of the 20th he was informed that Acland’s brigade could be seen ‘in the offing’ ibid. The GO 20 Aug 1808 and AW to Capt Bligh 11-30am 20 Aug 1808 WD III p 88 confirm that Acland had not yet arrived, and AW’s intention to march on Mafra: also AW to Castlereagh 20 Aug 1808 WD III p 87. Murray however (in his review of Napier) says that Acland could be seen coming up from the south (p 192). Given the opportune arrival of Anstruther’s brigade and part of Acland’s in time to take a leading part in the battle of Vimeiro it is legitimate to ask how far Wellesley’s success depended on this fortuitous event – and by inference, to what extent critics who felt that his whole campaign was rash were justified. The obvious retort is to point to the comparative ease of the victory and the number of British troops who were not engaged. This is not always a fair argument (the whole army would have been formed differently and one cannot simply remove troops from where, in the event, they were not needed); however in this case the margin was so great that it holds good: AW did not just have one or two spare brigades: half his army was engaged only very lightly, if at all. During the 20th a number of French cavalry patrols came close to the British position and one even penetrated as far as the beach where Anstruther’s brigade was landing. This naturally encouraged Burrard’s caution, for the British commanders, including Wellesley, were sensitive to the weakness of their own cavalry; although to Wellesley, perhaps reflecting the lessons he had learnt in fighting the Marathas, the appropriate response was to seize the initiative and advance rapidly so that the enemy did not gain confidence. More immediately the activity of the French cavalry and the proximity of the main French army put the British on the alert, and in the evening a Portuguese peasant reached headquarters with news suggesting that Junot was planning a dawn attack on the 21st. Wellesley therefore issued orders for the troops to sleep in their accoutrements and to be under arms at 3am. (Night Pass Order WD III p 88; Wynyard ‘Vimeiro to Corunna’ 20 Aug 1808 p 36 see also Warre Letters from the Peninsula p 20). The question then naturally arose as to whether the order which had been given for moving forward on the following morning should be carried into effect or not. It was conceived, that the enemy being at hand with his whole force, but without any certain knowledge being possessed as to his actual situation, he had it in his power to bring on a general action whenever he might think fit to do so; that, considering the enemy’s more perfect knowledge of the country, his great superiority of cavalry, the length of the march to Mafra, and the reported badness of the roads – and adverting, likewise, to the long train of bullock-carts, incapable of moving at a quicker pace than two miles in an hour – all the disadvantages of sustaining an attack whilst on the march would be experienced, probably, to their fullest extent; especially as the enemy was not so inferior in numbers, if at all inferior, as to compensate for the disadvantages which he in other respects possessed: – that, even if the army should reach the neighbourhood of Cascaes without being attacked on the march, or without sustaining any considerable loss, the enemy would be enabled probably to bring into the field, in the immediate vicinity of the capital, for a decisive battle, two or three thousand men more than he could venture to draw to so great a distance from Lisbon as where the British army then was. To these considerations was also added the very important one, that, having a reinforcement of ten thousand men close at hand, Sir H. Burrard not having quitted the convoy till it had arrived off Cape Finisterre on the 16th, to move forward with the present force only, and in a state of perfect uncertainty as to when, and where, and under what circumstances, an action might take place, decisive, for a time at least, of the result of the very important enterprise in hand, was a line of policy, the prudence of which might well be questioned. Upon all these grounds, therefore, Sir Harry Burrard decided against moving the army towards Mafra on the following day; deeming it better to receive the attack, unembarrassed, and in a fixed position, known to the troops, than upon the march, under the embarrassments, and on unknown ground; and resolving, should the enemy delay attacking, to strengthen the position – profit by favourable weather to land provisions and stores from the shipping at Maceira – and wait the arrival of the troops under Sir John Moore. (Anonymous review by George Murray of Napier’s History of the war in the Peninsula in Quarterly Review vol 56 April 1836 p 193-4). My intention was to march on the morning of the 21st, and orders were issued accordingly. I should have pushed the advanced guard as far as the height of Mafra, and should have halted the main body about four or five miles from that place. By this movement the enemy’s position at Torres Vedras would have been turned, and I should have brought the army into a country of which I had an excellent map, and topographical accounts, which had been drawn up for the use of the late Sir Charles Stewart [Stuart]; and the battle, which it was evident would be fought in a few days, would have had for its field a country of which we had a knowledge, not very distant from Lisbon, into which town, if we had been successful, we might entered with the retreating enemy. (Proceedings p 28 WD III p 142, see also Proceedings p 98). Foy argues that if AW had advanced as planned on the 21st his army would have been highly vulnerable – strung out along a single narrow road with many defiles and with its flank exposed to the French. Without paying attention to the force collected at Torres Vedras, the English General prepared to march by the the narrow and flinty road of Mafra. This, for the space of six leagues, runs parallel to a steep coast, and forms a succession of defiles, in which the army, lengthened out in a single column, would have been perpetually assailable in rear and flank, while there was not a single spot where it could form in order of battle. (Foy History vol 2 p 514). On the other hand Burghersh Memoir of the Early Campaigns of the Duke of Wellington p 27-29 argues that the ground on the flank of the line of advance was impenetrable, and that if the British had advanced as planned the French would have had to fall back hastily or risk the British getting between them and Lisbon. Given Wellesley’s skill in the rest of the campaign the latter seems more probable. According to Sir Charles Oman’s careful calculation the French field force amounted to 10,400 infantry, nearly 2,000 cavalry and about 700 artillerymen with 23 guns. (AW estimated French cavalry at Vimeiro at only 1,200-1,400 cf his normally over high estimate of their infantry etc Proceedings p 33 WD III p 146). This may possibly be a little generous for Loison’s long march in the mid-summer heat must have depleted his units by many stragglers and sick, but all such figures involve an element of approximation. These troops were not generally veterans of the Grandé Armée. There were four strong battalions of infantry in the 70 and 86 Ligne: regiments which had been left in France when Napoleon led their comrades to war with Austria, Russia, and, later, Prussia. Nonetheless they were good seasoned units which still contained many veterans of the Revolutionary Wars. Most of the rest of the army was well below their standard: the infantry were third battalions which had only been raised a little while before they began their march on Portugal. Junot had stripped the grenadier companies from each battalion and combined them into regiments of grenadiers (each of two battalions). As usual this had the advantage of quickly creating an elite force at the cost of weakening the rest of the army, as units lost most of their best men. The cavalry and artillery also consisted of a high proportion of recent conscripts, but the officers of the army were excellent and ensured a high degree of professionalism throughout the force. The army had been together for a year and although it had seen little action it had shared enough exertions and deprivations to create considerable esprit de corps, while the string of French victories over the last few years had imbued it, and especially the commanders, with great confidence. (Oman vol 1 p 246-7; Foy History of War vol 2 p 3-4). Before Vimiera, a cavalry vedette, I think, a German, rode up to the Duke in a state of fear, which the Duke said literally lifted the helmet from his head. “How many, do you think? said the Duke. (Croker Papers vol 2 p 122, account of Wellington’s conversation at Walmer, 25 May 1831, gives same story with fewer details). Landsheit (The Hussar p 131-5) states that he was the man who brought the news and gives a detailed account of his patrol while strongly disputing the claim (published by Napier) that he was alarmed. ’20th …. In the evening of this day, a peasant gave the information of a French column of 3,000 men being in motion from Torres Vedras, in consequence of which the Army was ordered to sleep in their accoutrements, and be under arms at 3 o’clock in the morning. This suggests that the men had come off the high ground and back to camp and that they were sent direct to the left because that was where an attack had been anticipated. Fane and Anstruther had six battalions. Anstruther had four: 2/9th, 2/43rd, 2/52nd and 2/97th. Fane had 1/50th and is listed as having 5/60th and 4 coys of 2/95th by Fortescue (vol 6 p 219). But this ignores AW’s GO of 18th August attaching 1 coy 5/60th to each line brigade. Presumably 5 companies of 5/60th were thus detached (assuming none joined Anstruther or Acland) and this would reduce Fane’s brigade to marginally under two battalions, unless these riflemen had been recalled to strengthen the advanced picquet, which seems unlikely. Oman (vol 1 p 250-1n) puts Anstruther’s brigade at 2,703; and Fane at 2005 but this counts all the 5/60th, half of which had been detached, so deduct c300 men (half the 600 of 5/60th). This gives 4,400 but add Acland’s light companies which (according to Oman vol 1 p 256) joined the defence say 300 or a total of 4,700. But the roughness of these figures is obvious: any pretension to precision is misleading. Oman (vol 1 p 246-7n) gives Thomières brigade (1st and 2/86 Ligne) 1,945 all ranks; Charlet (3/32, 3/82) 1,997 all ranks (both figures including detached companies of grenadiers); Grenadiers 2,100: gross total 6042. Allow for double counting of grenadiers, say 500. Rough total about 5,500. But this apparent French advantage is illusory, for there were substantial British reserves close at hand if they were needed (most immediately the brigades of Hill and Acland). ‘[at the commencement of the battle] Sir Arthur Wellesley desired me to ride as fast as I could to General Anstruther and to General Fane, and to convey to them his orders that they should not move from the position which they occupied in front of the village of Vimeiro, without further directions from Sir Arthur. On my arrival at that position I found that General Fane had advanced a little way in front, and was engaged with some French light troops. I followed him and delivered these orders, and he consequently retired: this was about half-past nine in the morning; but I cannot speak with any degree of accuracy’. The French attack on Vimeiro Hill and village was made by eight battalions in three brigades: Thomières (1+2/86e Ligne), Charlot (3/32e + 3/82e Ligne) and Kellermann’s grenadier reserve (four battalions). French accounts describe a succession of separate attacks by each of these brigades in turn, while British primary sources suggest rather a single furious onslaught. (Foy History vol 2 p 519-22; Thiébault Memoirs vol 2 p 206-7. Oman (v. 1 p 254-7) and Fortescue vol 6 p 225-9 follow them). Given that each side had roughly the same number of men at this point (about five thousand infantry plus artillery and, at the end, some cavalry; the numbers slightly favouring the French) it would be surprising if the French did not bring their full force to bear in one attack, even if the troops advanced in several waves. Still, Foy and Thiébault – our French sources – were both present in responsible positions, and their testimony cannot be lightly discarded; so the question must be left open. The enemy came down rapidly along the road, directly in front of the 50th (belonging to General Fane’s brigade), and when within about nine hundred yards deployed to their left, so as to bring their front parallel to ours; heavy cannonade from our guns, which caused the enemy much loss but did not check his advance. Brigadier-General Fane sent out nearly all the 60th and [some] companies 95th to skirmish with the sharpshooters; after a good deal of firing our people were driven in. Sent the light company 97th and three companies 52nd to cover their retreat; the latter made a gallant stand, but were at length driven in almost to the position, and finding it impossible to stop them without great risk, [I] ordered the 52nd to support them on their right, and, if possible, to turn the left of the enemy. This they did very dexterously; whilst the 97th made a vigorous attack in front. The enemy soon gave way, and was pursued to the skirts of the wood, beyond it his superiority in cavalry made it imprudent to advance. Rallied the 97th and 52nd, and leaving strong picquets in the wood, brought them back to the position: the 9th remained in reserve and was but little engaged. ‘In the meantime, Brigadier-General Fane, on my left, was very warmly engaged. The enemy advanced with great boldness against the front of the 50th, whilst another column tried to penetrate into the village of Vimeiro on his (Fane’s) left, along a deep hollow road which partly concealed them. Sent the 43rd and all the cavalry to Fane’s assistance – the former being obliged to put two companies into the front houses of the village, the enemy being very near it. The 50th regiment, however, by a very bold attack, defeated the enemy opposed to them, taking all their guns, tumbrels, etc; and the 43rd, with equal gallantry, came to the bayonet with the corps on their left, and drove them completely back. The rifle corps and 20th [light] dragoons then went out in pursuit, but the latter advancing too far, and getting near a wood filled with the enemy’s infantry, suffered very much. (Anstruther’s Journal quoted in an anonymous review by George Murray of Napier’s History of the war in the Peninsula in Quarterly Review vol 56 April 1836 p 198-99; see also Colonel Walker’s account, which gives much greater credit to his regiment, the 50th, in Fyler’s History of the 50th p 105-6 and Wynyard ‘Vimeiro to Corunna’ p 36). It is unusual to get such a detailed account from a subordinate general, and it is interesting to see the flexibility with which he employed his units, dispatching the 43rd to reinforce and protect Fane’s left, while using the 52nd to assail the flank of the French who were facing the 97th. The emphasis on the bayonet rather than musketry is striking, but agrees with other first hand testimony. Unfortunately none of our sources gives much information about the French formation and tactics although there are references to French columns. Rifleman Harris gives a more personal, less detached, account of the fighting which may not be as accurate as Anstruther, but which reminds us of the human element (Rifleman Harris p 35). Leach (Rough Sketches p 50-1 and his letter printed in Verner’s History and Campaigns of the Rifle Brigade vol 1 p 160-1) is another excellent source on the experience of the Rifles. Captain Patterson’s account of the 50th (in Fletcher Voices from the Peninsula p 19-23) does not entirely convince, being clearly written years later and with much striving for literary effect. Colonel Walker also gives an interesting and highly coloured account of the role played by the 50th, oddly written in the third person, and shamelessly exaggerating the strength of the French, but with good details of the tactics he employed (it is printed in Fyler’s History of the 50th p 105-6). Much less detailed but more credible are the accounts of Hardinge (letter to Lord Camden, August 1808 quoted in Charles, Viscount Hardinge Viscount Hardinge (Oxford, Clarendon Press ‘Rulers of India’ series, 1891) p 15-6) and Wynyard (‘Vimeiro to Corunna’ p 36). The former also describes the fighting involving the 43rd near the village and the latter the role of the artillery. Landsheit gives a vivid if not entirely reliable account of the charge of the 20th Light Dragoons (The Hussar p 137-9), while Hardinge gives a useful description of the role of the Portuguese dragoons. Col. Landmann’s very long, detailed account is full of anecdotes, some of which have clearly been improved in the telling, but on the whole it rings true and accords with other accounts, though you can never expect complete agreement especially over the sequence of events. Leslie’s Military Journal p 49-50 gives an observer’s view of the 43rd which is interesting, but it raises doubts: could he really have seen this? Thiébault’s account is not very useful, but Foy’s is quite detailed and has clearly influenced Oman. James Arnold ‘A Reappraisal of Column versus Line in the Peninsular War’ J. Military History vol 68 April 2004 p 545-6 quotes Londonderry’s Narrative of the Peninsular War vol 1 p 144 (also in the abridged edition entitled Story of the Peninsular War p 74-5; author’s name also given as Charles William Vane) for evidence that Solignac’s brigade deployed into line at Vimeiro. However, pace Arnold, Londonderry (i.e. Charles Stewart, who later changed his name to Vane and inherited the title of Lord Londonderry) was not present at the battle – he arrived later. This does not mean that the French definitely were in columns, although this is how most British accounts describe them; but the evidence is not conclusive and accounts like Roderick Murchison’s clearly do not carry great weight when mentioning enemy formations, while ‘lines’ and ‘columns’ are often used vaguely, even generically as a term for a body of troops. Perhaps the underlying message is that the formation employed was not really as important as has commonly been argued. Oman and other secondary accounts generally suggest that Brennier was chiefly opposed by the 71st and 82nd Foot, with the 29th merely supporting them and not really engaged, and this seems supported by Leslie and Gell. According to the official returns Anstruther + Fane + 20th Light Dragoons lost 413 casualties, while Ferguson + Nightingall lost 282 (slight distortion as all 5/60th casualties are included under Fane). But the 71st lost 112 casualties – only just below the 43rd’s, 118 (highest in the army) and the 36th (with 51), 40th (with 44) and 82nd (with 61) all lost significantly – enough to show that they were seriously engaged. Still, none of these were very heavy losses. The British troops had fought extremely well, both in the centre where they defended a modest position against determined attack, and on the left where they had to manoeuvre and recover from being surprised at the moment of victory. Particularly commendable was the discipline which prevented their pursuit of a fleeing enemy getting out of hand and exposing them to a counter-attack. The 20th Light Dragoons failed in this regard and suffered accordingly, but they were too weak to act effectively and still retain a reserve, so it is not surprising that once committed they got into trouble. A young staff officer, Henry Hardinge, at the beginning of a career which would see him become Commander-in-Chief and one of the greatest of Victorian military heroes, reflected: ‘it is a source of peculiar satisfaction to have discovered that in skill and manoeuvring light troops we are in no way inferior to the French’, and he went on to praise the British artillery as clearly superior. (Hardinge Life p 16). Other sources also praised the British gunners and Wellesley named them first among the units he praised and thanked for their performance in the battle. Privately he attributed much of their effectiveness to the newly-invented shrapnel shells, but carefully abstained from giving this any publicity lest it alert the French. (Wynyard ‘Vimeiro to Corunna’ p 36; AW to Burrard 21 August 1808 and AW to Sir J. Sinclair, 21 Oct 1808 WD III p 90-93, 129-30; Duncan History of the Royal Artillery vol 2 p 210. See also Neale Letters from Portugal and Spain p 13). Wellesley’s conduct of the action is hard to assess, for the sources reveal only the occasional glimpse of his presence (on the left rather than in the centre) and his actions. The orders he gave have all disappeared save for the few recorded in various memoirs. Nonetheless it is clear that battle enhanced his reputation with the officers and men of his army and that this is not always the case even in victory (for example Cathart at Copenhagen, or Stuart at Maida). Given the numerical balance in favour of the British it was not a difficult battle to win, but as Burrard’s folly in failing to pursue shows, even the best opportunities can be squandered and no battle is a certain victory. Fortescue’s plea in mitigation of Burrard’s folly (vol 6 p 215-6, 232-34) is more damning than any overt criticism and recalls Mrs Jackson’s comment: ‘He is a very good sort of man, and if he was unfit to command an army, they who gave him the command ought to have known that, for I am sure everyone else knew it’. (Letters and Diaries of George Jackson vol 2 p 378-9). The responsibility for his selection evidently rests with the Duke of York, not the ministers; and the mistake was in selecting a man well suited to be second-in-command, while forgetting that a second-in-command has to be capable of replacing his chief (e.g. if Dalrymple’s convoy had been delayed a week, or he had been shipwrecked). On 8 Nov 1808 Tom Grenville wrote to his brother Lord Grenville, ‘I am told by good authority that Burrard was himself inclined to the pursuit after the battle, but was influenced by Clinton’s opinion the other way’ (HMC Dropmore vol 9 p 239-41). This is supported by an entry in Windham’s diary dated 15 Oct 1808: ‘In the morning saw Ferguson (Major-General); satisfied by him both of the general merit of Sir Arthur Wellesley and of the main points of his case in the present instance … certainly overruled as to the renewal of the action and the plan of marching previously. Clinton supposed to be the person who determined Sir Harry’ (Windham Diary of William Windham p 481). This helps to explain AW’s subsequent hostility towards Clinton: he moved to prevent him succeeding Anstruther as Adjutant-General in Ireland (AW to Col H. M. Gordon 22 Jan 1809 WSD vol 5 p 537 Ward Papers 300/3/3 for names) and in 1811 prevented his being sent to the Peninsula for more than six months (from February to September). When he lifted this veto he referred to previous differences of opinion and implied that he had not trusted Clinton to accept his authority in the delicate situation of early 1811: after Masséna’s retreat Wellington’s standing was, of course, much enhanced. (Wellington to Torrens 11 Sept 1811 WD V p 264). This is in marked contrast with AW”s continued friendly correspondence with George Murray in September 1808 and beyond, even though Murray had agreed with Clinton on the night of the 20th, advising Burrard not to permit the army to advance on the morning of the 21st, and was the officer whose few words aside persuaded Dalrymple to advance on the 23rd (which left AW feeling particularly sore at the time). Immediately after we had defeated the right column of the French army, which had made its attack upon our left, and were then retreating in a precipitate manner, Sir Arthur Wellesley rode to Sir Harry Burrard, and said, “Sir Harry now is your time to advance, the enemy are completely beaten, and we shall be in Lisbon in three days. We have a large body of troops, which have not been in action, let us move them from the right on the road to Torres Vedras, and I will follow them with the left.” Sir Harry Burrard replied, that he thought a great deal had been done, very much to the credit of the troops; but that he did not think it advisable to move off the ground in pursuit of the enemy. Sir Arthur Wellesley remarked at the time, that the troops were perfectly ready to advance, having provisions cooked in their haversacks, according to the orders of the day before. Q [from Sir Arthur Wellesley] Do you recollect my mentioning, that the troops had plenty of ammunition, that there was twelve days bread in camp for the original number of the army, and a sufficiency of every kind of store in reserve with the artillery? A. I recollect Sir Arthur Wellesley mentioning that there was plenty of ammunition, that the mules with the reserve musquet ammunition were in the rear of the brigades, that we had an abundance of ordnance stores and plenty of provisions; but I cannot call to my recollection whether he specified at that time the number of days provisions we had in camp. Q (By desire of Sir Harry Burrard) How long a time elapsed from the French being defeated in the centre till the end of the action? A The right column of the French arrived at the point of attack on our left about 10 minutes or a quarter of an hour after his left column was defeated by our centre: I cannot speak with any accuracy as to the length of the action on the left – it might probably be an hour more or less. The Vimeiro wounded were taken by ship to be treated at Oporto. Although the distance from the battlefield to the beach was short it was rough and they must have suffered greatly; fortunately the surf was moderate so getting them on board ship was not too difficult. See excellent description from Adam Neale Letters from Portugal and Spain p 24-25. Dalrymple told the Cintra Inquiry that he first met AW, briefly on morning of 23 August as AW was on the way to the beach to supervise the embarkation of the wounded (Proceedings p 39). The detailed return in the London Gazette lists 716 casualties in its detailed breakdown by unit, 720 in the abstract, and has five officers named as casualties who are not listed in the breakdown, making a presumptive total of 721. I have used the figure in preference to the 720 given in the abstract printed in WD III p 93 and accepted by Oman (vol 1 p 261) and Fortescue (vol 6 p 234) but there is much uncertainty in any casualty return. A greater conundrum is Verner’s much higher figure for the casualties of the 2/95th: 37 killed and 47 wounded, a total of 84 casualties cf 6 killed, 15 wounded and 3 missing, a total of 24 casualties according to the official return (History and Campaigns of the Rifle Brigade vol 1 p 166): a discrepancy which defies explanation. *Five officers are named in the list of names in the London Gazette as wounded, but not included in the total for their regiment: three in the 43rd, one in the 50th and one in the 52nd; this should raise the total number of wounded officers to 38 and the total casualties to 721. Including the named officers, there were a total of 44 officer casualties and 677 men a ratio of 1:15; but oddly among those killed it was much higher, 1:33. Curiously, Lieutenant-Colonel George Tucker, the Deputy-Adjutant General who compiled these figures, gave a grand total of 783 casualties for the whole army, killed, wounded and missing, by not just including officers and men, but also horses! Dalrymple’s arrival had been announced on the morning of 22 August when the man-of-war in Maceira Roads fired a salute to greet him. Burrard dispatched Murray and Clinton to the beach to meet their new commander. On the way the two staff officers discussed the rapid succession of commanders and Murray proposed that they suggest to Dalrymple that the whole army already ashore be entrusted to Wellesley as a corps d’armee, with Sir John Moore being given similar authority over the troops yet to land. The arrangement would only be temporary, until the campaign against Junot was concluded. Clinton doubted that Dalrymple and Burrard would be keen to surrender so much of their authority but agreed to second Murray in proposing the scheme. According to Murray’s later account Dalrymple was at first willing to approve the arrangement but soon after his manner changed abruptly and he behaved with ‘an appearance of coldness and reserve’ towards Wellesley. Neither Murray nor Wellesley were present in the interlude which wrought this transformation and Murray gives no explanation for the change in Dalrymple’s attitude, but it seems reasonable to suppose that he realized that if he accepted the arrangement his own authority would be reduced almost to nothing. Whether this realization was assisted by Clinton or Burrard is another question. (Murray review of Napier in Quarterly Review April 1836 p 201-202). Other sources give different accounts. Dalrymple told the Court of Inquiry that he met Wellesley briefly at Maceira, soon after he landed, when Wellesley passed through the village on his way to the beach where he was going to supervise the embarkation of the wounded. Dalrymple makes no mention of Murray’s proposal, but did not conceal from the Court that he believed that Wellesley had undertaken a perilous campaign in which victory could bring no real advantage and the slightest setback would lead to disaster. Nonetheless he had intended to let Wellesley succeed or fail as best he could while he, Dalrymple, joined the reinforcement in Mondego Bay. This extraordinary abdication of responsibility was only prevented by news that a battle had been fought and that Sir Harry Burrard was now in command of the army. (Dalrymple’s Narrative, Proceedings p 39-40). Ward suggests that AW over-played his hand, taking too energetic a tone and that Dalrymple’s pride was aroused. This is quite plausible; but equally it is clear that Dalrymple had already formed a poor-opinion of Wellesley before they first met. (Ward’s Murray extract p 13/27). A common view held that Hill’s brigade, which was fresh and had not suffered any casualties, could have intercepted the retreating French at Torres Vedras. A chaplain [Rev. J.W. Ormsby] in the brigade wrote: “This is the general sentiment of the army; and such is their confidence in the abilities and valour of Sir Arthur, that the mere knowledge of these movements having been his wish and request, is sufficient to convince them of their prudence and practicability”. We were exactly in the nick of time for the action of the 21st (for we did not join Sir Arthur Wellesley till the evening of the 20th) which we had our share in. It commenced about eight in the morning and continued for three hours when they thought it high time to do the right about. The French general who came in with the flag of truce next day acknowledged they had lost between three and four thousand, while the loss on ours did not amount to above 700. Most unluckily for the British Army, Sir Harry Burrard had joined the army that morning and would not allow Sir Arthur Wellesley to follow them up with four brigades that were fresh and had not been engaged; which had he been allowed to do, there is not the most distant shadow of a doubt but that the enemy would have been cut off to a man, the French say exactly the same thing. I assure you we all wish both the 1st and 2nd in command out of the way, for the 3rd & 4th are liked as much as the other two are disliked. I don’t know what you may be in England but here we are not at all pleased with the terms, we think we have given them much too favourable. (Charles Kinloch A Hellish Business edited by Gareth Glover (Godmanchester, Ken Trotman Publishing, 2007) p 27-28). Leslie Military Journal p 54 says that the army did not much relish the news of the armistice being flush with their victory, the officers looking to promotion and prize money, the men to booty – many, especially of the light troops, had already secure rich pickings from fallen Frenchmen, but they were eager for more. As soon as Moore had heard of Vimeiro he had written to congratulate Wellesley, and as he learnt more details of the battle from Catlin Craufurd his initial impression was confirmed: ‘The action of the 21st had been very complete; the French attacked our centre and left and were completely beaten … Our loss amounted to about 800 killed and wounded; the French is supposed to have been about 2000. (Moore Diary vol 2 p 257-8). Moore went on to reflect that ‘seniority in the Army List is a bad guide in the choice of a military commander. Sir Arthur Wellesley seems to have conducted his operations with ability, and they have been crowned with success. It is a pity, when so much has been thrown into his hands, that he has not been allowed to complete it, and the conduct of Government on this occasion has been absurd to a degree’. But of course this was exactly what the government had wished to do, and had been prevented by Moore’s friends at the Horse Guards and by the King who were anxious both to protect Moore’s reputation and the claims of seniority. It was a nice gesture for Moore to tell Dalrymple that Wellesley should be entrusted with the effective command if operations were resumed, but far too late, for the damage had been done six weeks before in London. (Moore Diary vol 2 p 257-9). I will not conceal from you, however, my dear lord, that my situation in this army is a very delicate one. I never saw Sir Hew Dalrymple till yesterday; and it is not a very easy task to advise any man on the first day one meets with him. He must at least be prepared to receive advice. Then I have been successful with the army, and they don’t appear to me to like to go to anybody else for orders or instructions upon any subject. That is another awkward circumstance, which cannot end well; and, to tell you the truth, I should prefer to go home to staying here. However, if you wish me to stay, I will; and I only beg that you will not blame me, if things do not go on as you and your friends in London wish they should. (AW to Castlereagh 23 Aug 1808 Castlereagh Correspondence vol 1 p 410-12). This is fair enough on its own terms, but it does also suggest that Wellesley would have found it very difficult to accept being simply one subordinate among many, playing no special part in the army. Of course he never actually faced that challenge, but one does wonder how he would have behaved if he had served under Moore. Wellesley had already, on 5 September, written to Castlereagh with a detailed assessment of the strategic position which showed the keenness of his interest in the coming campaign. He began by warning Castlereagh that he had little reliable information on the position of the armies in Spain, although he believed that the French would have great difficulty employing a force of more than 40,000 men on any one line of operations due to the shortage of supply. He recommended that 15,000 British troops including a good proportion of cavalry and artillery be sent to join Castaños’s army, which might then be capable of meeting the main French assault. Another 5,000 men should be kept in Portugal to help the Portuguese government. This left about 20,000 men, half in Portugal and the remainder still at home. Wellesley suggested that this force be based in the Asturias so that it could act ‘upon the flank and rear of the enemy’s advance upon Madrid’. And he recommended that part of the force in Portugal be re-embarked and sail to Asturias, although an overland march was possible. (WD III p 113-17 see also AW to Castlereagh Correspondence vol 6 p 476-81). It is fortunate for Wellesley’s reputation that these ideas have fallen into obscurity for they lack the usual shrewd sense of the practical and would surely have led to disaster far greater than the difficulties experienced by Moore’s army in its campaign in Spain. 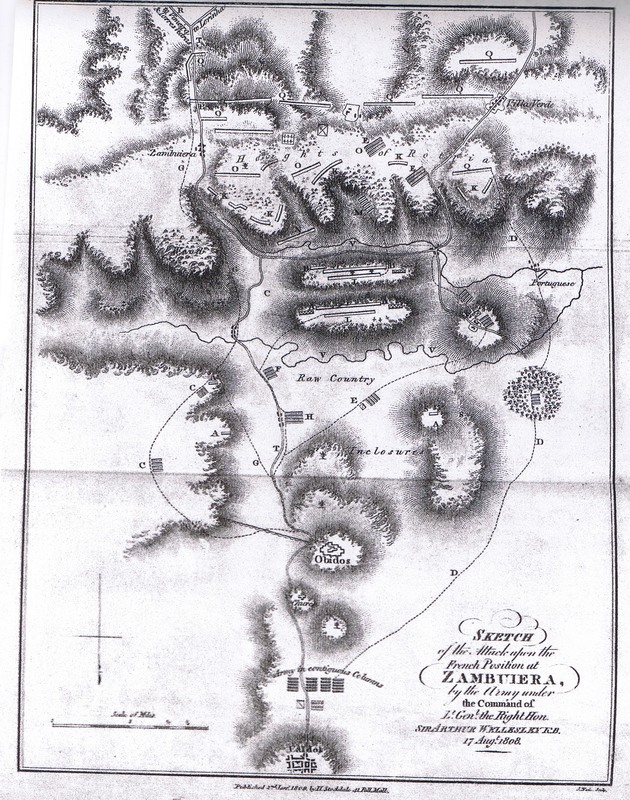 Fortunately the ideas were overtaken by events and had no influence in shaping British strategy – the government adopted a much simpler, more conservative plan which still proved too venturesome – but it is interesting to see that even Wellesley was misled by the high expectations and lack of accurate information about the Spanish armies in early September1808. Gathering better intelligence was one of Dalrymple’s tasks but he did not pursue it with much energy. On 9 September he suggested that Wellesley go to Madrid to liaise with the Spanish authorities and collect information, but Wellesley virtually declined, pointing to the lack of confidence with which Dalrymple had already treated him. This in itself was a sufficient reason, but Wellesley was now determined to go home and far from being flattered by the offer he doubted Dalrymple’s sincerity, telling Pole that Lord William Bentinck, his junior, had been offered the position before and was confirmed in it as soon as Dalrymple received Wellesley’s reply. (AW to William Wellesley-Pole 16 Sept 1808 ‘Letters to Pole’ p 9-11; AW to Dalrymple 10 Sept 1808 WD III p 120-1. Dalrymple to AW 9 and 11 September 1808 WSD vol 6 p 133-5. AW to Castlereagh 12 Sept 1808 ibid p 121-2). The news of Trail’s death provided both additional motive and an excellent justification for his determination to go home, and on 17 September he wrote to Dalrymple for permission citing not only Trail’s death but also the approaching of the rains which rendered an immediate resumption of active operations unlikely. (AW to Dalrymple Lumiar 17 Sept 1808 WD III p 124). AW also cites embarkation of the last French troops, as marking the close of the campaign, in support of his request. On Trail’s death see Richmond’s letters to Hawkesbury of 5, 18 and 23 August 1808 (all private) BL Add Ms 38,568 f 171-2, 179-80, 183 and reply of 22nd August ‘Private’ BL Add Ms 38,320 f74075. None of these letters suggest, let alone require, AW’s return, but it was clearly desirable if he was not engaged in active operation. This did not mean that AW gave up hope of participating in the coming campaign: he believed that part or all the army would go from Lisbon to northern Spain by sea, and that he could easily join it from England to Ireland having either resigned his civil position or appointed a successor to Trail. (AW to Castlereagh 18 Sept 1808 Castlereagh Correspondence vol 6 p 441-2, AW to Murray 19 Sept 1808 WD III p 124-5). In visiting London Wellesley also intended to speak to the ministers about the command of the army for he had become convinced, not only that Dalrymple must be replaced, but that the command should be given to Moore. This might not be accomplished easily, for before he had left England Moore’s always difficult relations with the ministers had led to an open quarrel with Castlereagh. However Dalrymple’s practical incompetence revealed the folly of entrusting the task to a novice, no matter how senior, and Moore was the obvious alternative. Probably mutual friends had let Wellesley know of Moore’s admiration for Vimeiro which would have been particularly welcome given Wellesley’s general soreness and sense of ill-treatment; and the prospect of serving under Moore certainly had greater appeal than that of Dalrymple, Chatham or the Duke of York as a chief – not only was Moore personally better, his relative lack of seniority would exclude some of the senior officers who would serve under York, thus giving more opportunity for the likes of Wellesley. But this was a secondary consideration: an incompetent general would lead the army to disaster, while Moore offered the best chance of success. On 17 September, the same day that Wellesley asked leave of Dalrymple, he wrote to Moore frankly outlining his intentions and his hope of smoothing the quarrel between Moore and the ministers. This was the letter in which he claimed, ‘Although I hold high office under Government, I am no party man’, before suggesting that his influence with the ministers was nonetheless considerable. Not surprisingly Moore reacted with caution, agreeing that Dalrymple was unfit to command the army but refusing to enter into any intrigue against him. Moore gave a moderate account of his quarrel with Castlereagh and agreed that it would be to everyone’s advantage if the differences could be resolved. In his diary he concluded, ‘If he [Wellesley] is sincere, and I have no reason to doubt him, his conduct is very kind. If he should be otherwise, I am no worse than I was for I said nothing to him that I would not have said to anybody with whom I had conversed upon this subject’. In the event the Ministers had already given the command to Moore before Wellesley reached London, so his intervention proved unnecessary; but his willingness to play the part of king-maker among his superiors is noteworthy. (AW to Moore, 17 Sept 1808, WD III p 123-4; Moore Diary vol 2 p 262-66; see also Charles Stuart to Castlereagh 17-18 Sept 1808 PRONI D3030/P/213/1 for some shrewd comments on AW and Moore). Wellesley sailed from Lisbon on the evening of 20 September in HMS Plover a sloop which was crowded by its passengers who included not only Wellesley and his party but also General Ferguson and his staff and a few junior officers such as Captain Harry Ross-Lewin of the 32nd. They had a close but peaceful inspection from a large Algerine frigate soon after leaving Lisbon, followed by a rough passage before reaching Plymouth on 4 October, where they found the whole country in uproar over the Convention of Cintra. (Ross-Lewin With the 32nd in the Peninsula p 121-22). The gift of plate was a sincere tribute and an expression of support after AW’s supersession. It was not a reaction to the controversy in England over Cintra (it pre-dated it). Nonetheless it attracted some criticism from Whigs and radicals in England as an expression of party feeling inappropriate in the army (see Cobbett’s Weekly Political Register of 12 Nov 1808 and Morning Chronicle of 20 March 1809 (incorrectly cited by Michael Roberts (The Whig Party p 134) as 26 March). Wellesley has the merit of the execution entirely, and will very deservedly reap the fruits of his talents and exertions. At the same time he has outstripped all common rules and even the most necessary measures of prudence, and had the French general made a soldierlike and wise use of the means in his hands the other must have been easily checked and might have suffered severely. In short he put everything to hazard but has fortunately succeeded. He seems to be a man of ability and great energy, somewhat headlong and presumptuous, but on the whole certainly a very superior person. (Hope to Mrs Hope, nr Sintra, 3 Sept 1808 Linlithgow Mss Box 19 f 105 in Ward Papers Ms 300/2/6). Sir A.W., in whose camp and family the example of language if the greatest insubordination has been set, and which I am sorry to say has spread through the whole army to an alarming degree [which is plausible enough, but then says that AW goes home] … ‘having artfully laid the foundation for being called on on some future occasion to command – both by his success (Much more owing to the blunders of the enemy than his own talents) and by the popularity he has courted and established in the Army. His manners have been familiar in the extreme with every rank, and those who knew him in India (where his brother’s powers made art unnecessary) represents his natural conduct at the head of an army as the very reverse; lofty, haughty, keeping everybody at a great distance: this shews him to be a clever fellow, thinking only of himself, and this is the judgement I believe, of all impartial ones, of his conduct throughout’. (T. Graham to R. Graham Lisbon 20 Sept 1808 HMC Graham of Fintry p 150).